It must be one of the trickiest parts of being a working mum – the school holidays. We have work that still needs to get done, a business that needs to carry on running as usual, and also children that need looking after while they are off school. As much as we’d love to drop all work related tasks and spend this time with our children, necessity dictates that for many of us this isn’t a realistic possibility. Also the thought of disrupting business to take some time off, can make you feel a little nervous – you don’t want to lose momentum or clients – but it can work. Have a read of my previous blog on taking a break from your business, to get some tips on how to manage this. Depending on your business and current workload it might be possible to tweak your working hours to be more child friendly. I always planned for my business model to allow less working and time off in the school holidays, and many mums in business can achieve this with some careful planning and scheduling. During school holidays, I like to minimise my workload and give myself ‘time off’ from all the thinking, planning and feeling like I should be doing more, that usually goes on in my head. 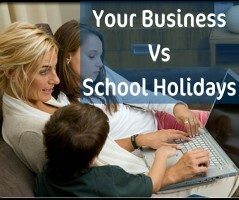 School holidays are always tricky to work out when you run a business from home and have young children off school, but between holiday clubs and family it usually works out well for me. Many of my clients are mums in business too, so some of my work naturally decreases in the school holidays, and some are glad that we plan to lighten the load during this time. Since we always know when the school holidays are going to be, I can plan ahead and be sensible with the amount of work I take on in the run up to this period, so that I don’t take on too much to fit in to the reduced time I have available. Also, I never start new projects or clients during this time, as my availability can be quite inconsistent, and that doesn’t sit well with me to give the best impression for a new client. It’s all about being realistic with what you can manage, in the time you have available, as with any other time of the year I guess! With the projects I’m working on that will continue through the holidays, client work that I carry out on an ongoing regular basis, and anything else that still needs completing during this time, if it’s something that can be carried out at a different time to usual then I notify my clients in advance that it will be slightly different to usual, perhaps saved up and completed in larger quantities at a time (maybe in advance of, or after, some time off), or it could be done on an alternative day. Anything that must be done at a particular time or day then just needs to be worked around. If your clients are also parents, they may be grateful of the offer of a meeting, telephone call or other contact outside of usual working hours during the holidays, as they may also be juggling their work around children. I bundle my tasks together and schedule the work into set days so I know when I’m working and when I’m totally off, or plan work for the mornings so I know I have the rest of the day to do other things. It makes sense to schedule it around the existing work that needs doing at a particular time, so if I have a few tasks that need doing on a Monday, then I can block out the whole day and move anything else that can be done then into the rest of that day, this includes both client work and my business related tasks. If you want (or need) to have the time off during the day, could you change your working hours for the school holidays so that you get the work done in the evenings or weekends instead of the daytime? Many mums do some work when the children have gone to bed, or when their partner is at home to help out. It might not be what you want to do long-term, but worth considering so that you can have the daytime free of work, spent with your children. Working in this time-condensed way can actually help you be more efficient as you have less time to complete all your tasks in. As long as you plan ahead and manage your clients’ expectations on your availability, no-one is going to begrudge you some time off. I plan my schedule out in advance, so I can see where I will be working and what days or times I will need to arrange childcare for. As I mentioned above, I will book the boys into a holiday club for some of these days, they will be kindly looked after by Nana, or we can arrange some play date swaps with other working families, so that I can help to look after someone else’s children on one of my days off and they will reciprocate with my children on one of their days off. Before they were old enough for our local holiday clubs, we used a childminder during the holidays, you may be able to find one that will take children on for the school holidays if they usually have a term-time child that isn’t attending. Don’t forget to really focus during these child-free times, get as much work done as you can, so you are not wasting this opportunity. Make a list and work through it, so you know what needs doing. Alternatively, could you outsource any of your tasks for this period of time, so you can switch off knowing it’s taken care of? This takes some planning and preparation if you’ve not done it before, so do think ahead if this appeals to you. What can you still get done? Alongside this, there are of course the bits and pieces you can get done while they are at home with you. Depending on the age of your children, and how much supervision they need, you can still get work done while they are with you. I know that a film for the boys will give me at least an hour, I can work from my laptop in the garden while watching them play, and some quiet time or a nap in the afternoon when they were younger gave me another snippet of time. My previous blog on spring cleaning your business has some ideas of business tasks you could do in the school holidays while the kids are around. You can still feel like you are getting something useful done, but nothing that requires complete concentration. If we are going on an actual holiday, I sometimes get nervous about switching off from work, feeling like I could be missing out on something, but do you know what? It really is bliss. My children and husband have my full attention, we have so much fun as a family and I remember my ‘big why’ – why do I do this work and run this business? Even though I switch off from work, it’s hard to completely forget about it, and having that space in my head from all the usual thoughts enables me to think a bit more clearly. I set some new plans, clarify a lot of things I have on the go, and some answers become obvious when I don’t think about them so much. Sometimes though, a bit of work is unavoidable, and if this is the case it is planned in advance and scheduled into a single timeslot if possible. My family know that on a particular day of the holiday I will be working, and I find myself somewhere comfy with wi-fi, a plug socket and cups of tea, and get my head down for that timeslot. See, there are ways to make sure you can relax and have some guilt-free time off, confident that your business is still ticking over nicely during this time. You are getting the essential work done when you can, and you can then go on days out, spend afternoons with friends, and enjoy the time with your children the rest of the time. If you need some advice on how to keep your business running over the school holidays, or where to focus your efforts in the time you have available, get in touch and we can work out a plan together.